Ah the great outdoors. What’s better than running out of the office at 4:59pm and being in your kayak and on the river by 5:30? Knowing that you’ll be camping overnight and paddling the next morning, that’s what. Planning a multi-day overnight paddling trip is a great way to experience your fave river or creek in sections, and cover a ton of ground. There are some extra preparations needed for a multi-day quest, and planning ahead is always a smart move. The following tips and MacGyver style camping life hacks will have you running the river and camping in comfort and style. Your boat will be your carry on or your checked bag for this voyage if you pack wisely. Unlike backpacking, you’re not technically having to carry every item you need. 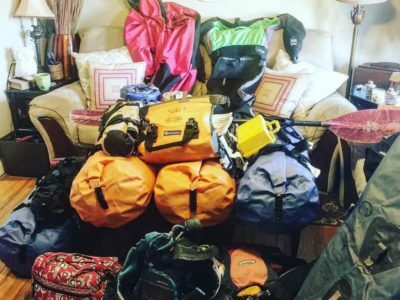 Start by putting everything you think you’ll need next to your boat at home to see how things can fit, and what’s going to work and what’s not. You’ll want to put heavier items at the bottom of the boat closer to the cockpit, and away from the bow and stern. This aids in keeping the weight distribution balanced. Items can be strapped to the deck, but remember this will affect wind resistance and change the balance of the boat. In the off chance something happens and you need to wet exit, which is rare because you’re a badass kayaker, know anything you have packed may end up in the drink. Don’t bring your new iPhone 7 along unless you have a good drybag to keep everything safe! 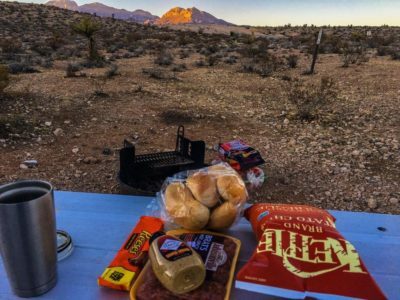 Just because you’re camping doesn’t mean you have to eat like a caveman. First of all, we need to point out the obvious fact that you’re on a river likely full of tasty aquatic creatures…just sayin’! If the laws in the area allow and you have a permit, you can consider bringing the necessary tools to season and prepare fresh fish. TIP: you can use flame sealed drinking straws or Tic Tac boxes to store spices. If you’re craving a steak, but don’t want to take down a large animal with your bare hands, you can bring frozen meat or foods to be eaten along the way. These items will slowly thaw, and can be prepared accordingly. Remember to put perishable foods on the bottom of your boat to help keep them cool. Craving something sweet? Make Camping Style Crescent Rolls you can fill with chocolate or what have you…deliciously genius! Kayakers are the some of the best of the best when it comes to improvising. Though you may have your line all planned out, life happens and you need to have the ability to change gears quickly. TIP: for tips on quick repair, Duct tape or Bituthene can come through in case of a hole in your boat. Some have seen the camping life hack to strap a head lamp to a jug or bottle of water to create a lantern, but did you know that you can use tortilla chips as a fire starter? BuzzFeed has this, and some other fantastic camping life hacks you need to check out before your trip, in their article here. Start planning now so you can be prepared and camp like a boss on your next overnight kayaking adventure. Remember to only bring what you really need, and as always, to leave no trace!